My plan to travel “border to border” across Mexico using only ground transportation (no airplanes) was cooked up on a foggy, cold morning in San Miguel de Allende. I had just arrived on the overnight bus from Dallas to an unseasonably cold December in the 6,000 ft mountains of central Mexico. Leaning up against the edge of the steamy pool in La Gruta Hot Springs, wisps of fog rising up off the hot water into the frosty 37 degree early morning air, I casually said to my brother Don, “I’d like to just keep going and explore more of Mexico, but I am not sure which direction to go.” As if he had been rehearsing it for hours, he recited an itinerary that would take me all the way to the Belizean border and beyond. I think he was a little surprised when I sent an email a few days later asking him to put his proposed itinerary to pen and paper for me. It would become my travel blueprint for the next two months. Don’s proposed itinerary covered a nice mix of old favorites such as Oaxaca and San Cristobal de las Casas, but also included enough few new stops mixed in to pique my interest. 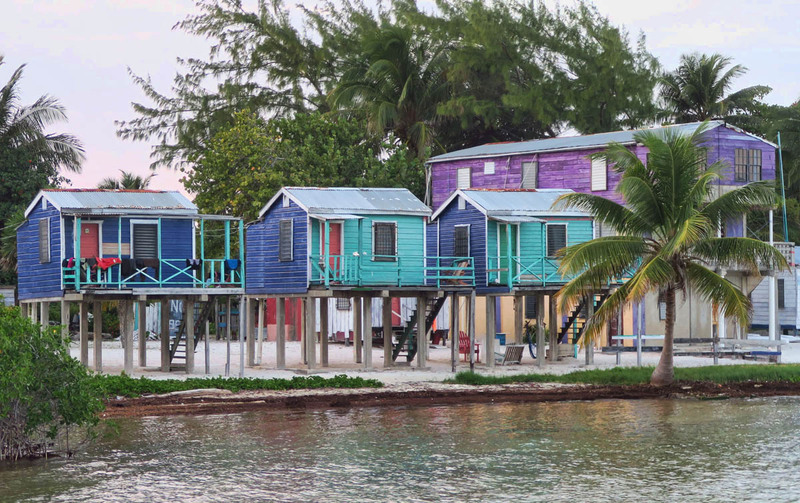 But none so much as Caye Caulker, Belize. 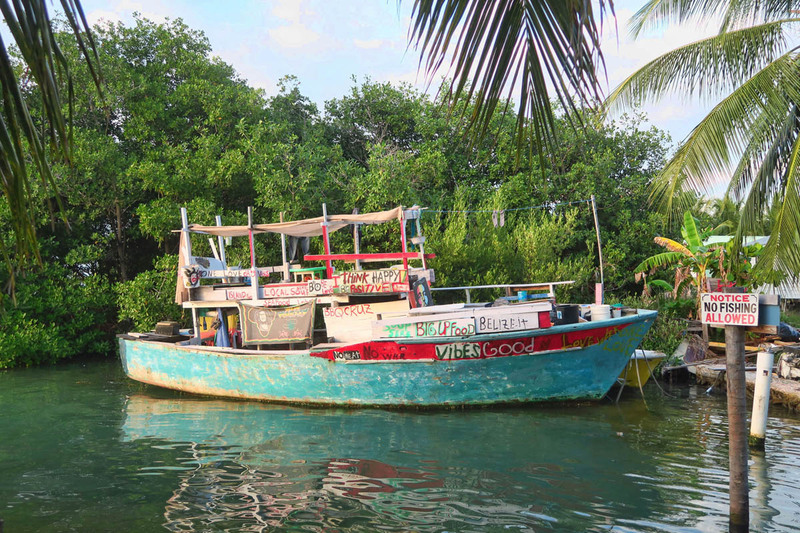 “There’s a bus from Palenque to Chetumal, where it’s only a four hour ferry ride to the rustic little island of Caye Caulker,” he said, “which is like a step back in time.” Having started at the Texas/Mexico border, I liked the idea of traversing the entire country of Mexico into Belize without having set foot in an airport. 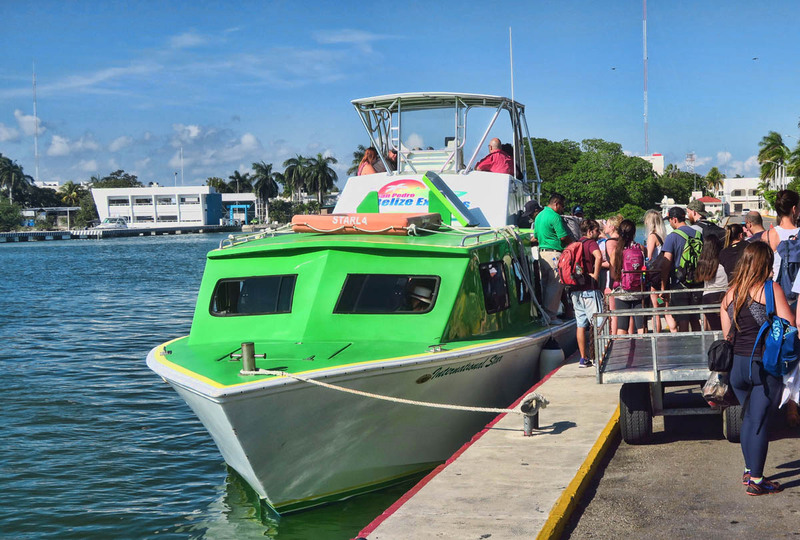 The ferry from Chetumal, mainland Mexico, is four hours by the time you count the stop in San Pedro to clear customs. 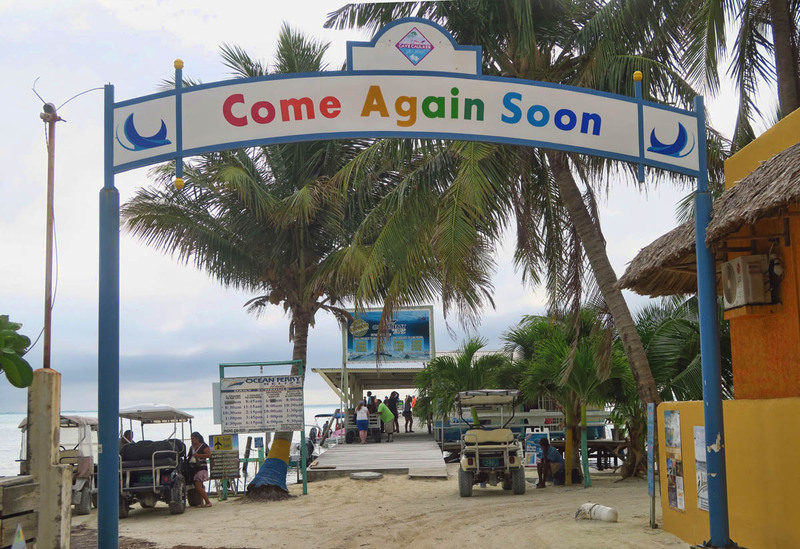 There is a much shorter route to Caye Caulker from Belize City if one is not a fan of long ferry rides. 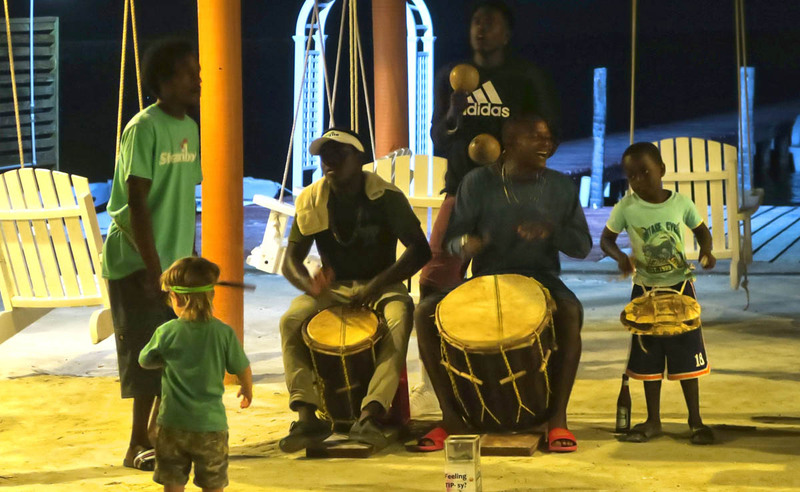 The minute I arrive on the island, I notice a shift in accents and music wafting through the air. Also wafting through the air is the smell of grilled seafood. Restaurants like this lure customers in by facing their grills toward the street so passersby smell and see the offerings. Their marketing strategy works. 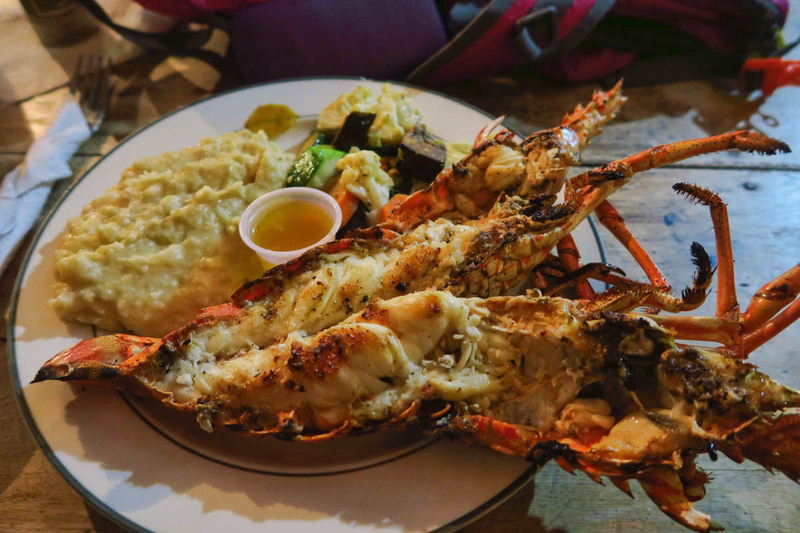 Grilled lobster, garlic mashed potatoes, and two Rum Punches for $25US. Expensive by Mexico standards, but not too bad for lobster. Cheaper eats can be found. 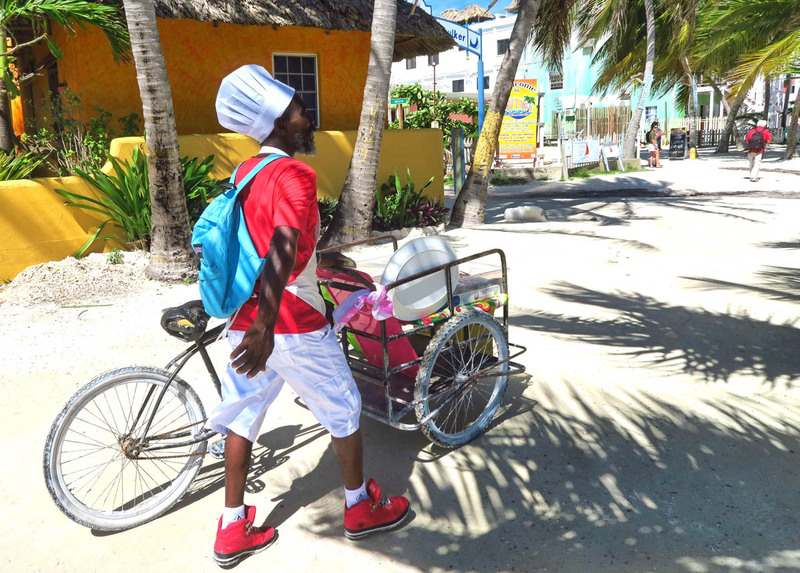 This man is selling coconut bread, coconut tarts, and banana bread from his bicycle cart. 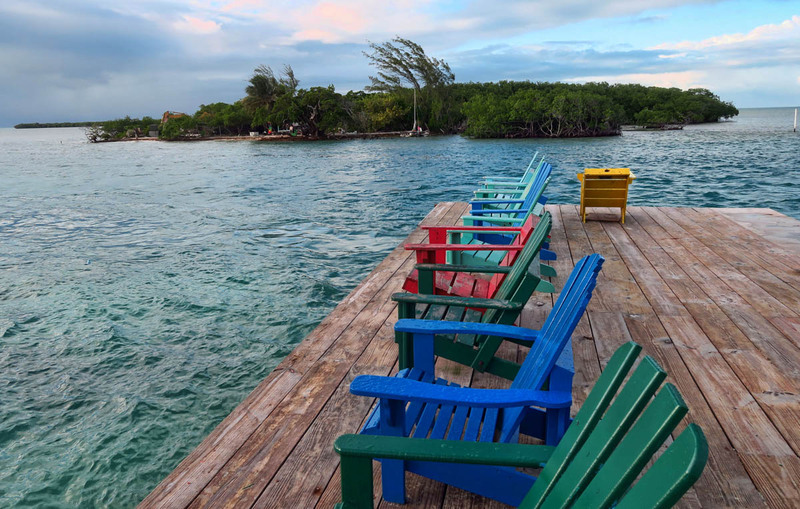 Caye Caulker is a small island only five miles long and a mile wide. I think there is maybe one truck on the entire island which is used for major maintenance jobs, but everything else from taxi service to trash pick up is done via golf cart. Five bucks will get you anywhere on the island in a golf cart taxi, including luggage. After that, its easy to walk everywhere. Bicycle rental is also cheap on the island, or even free from some hotels. 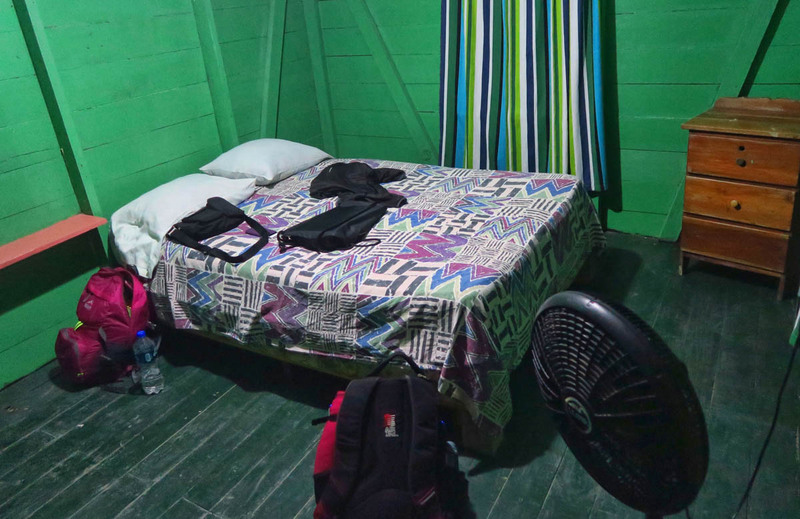 The cabin offers basic shelter and zero amenities, but it’s a sacrifice I am willing to make for a week on the island. This guy greeted me when I opened the door one morning. 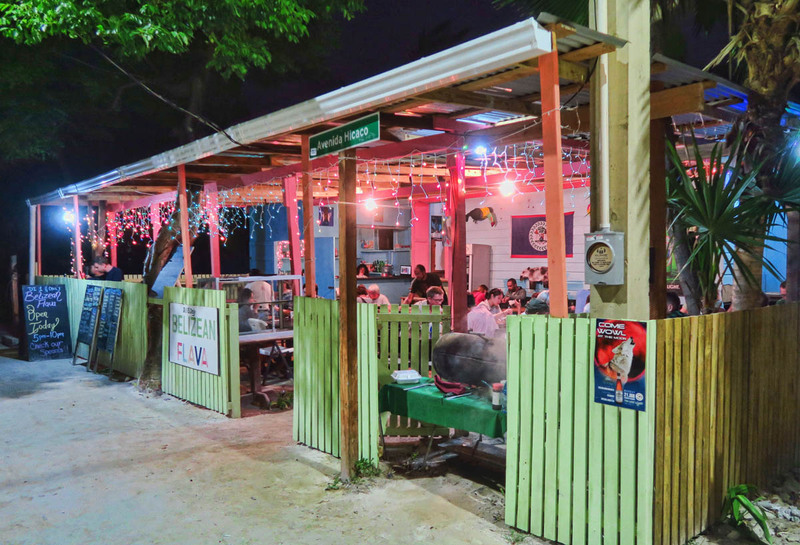 Ignacios may be rustic, but it’s a fair distance away from the noisier center of the island. 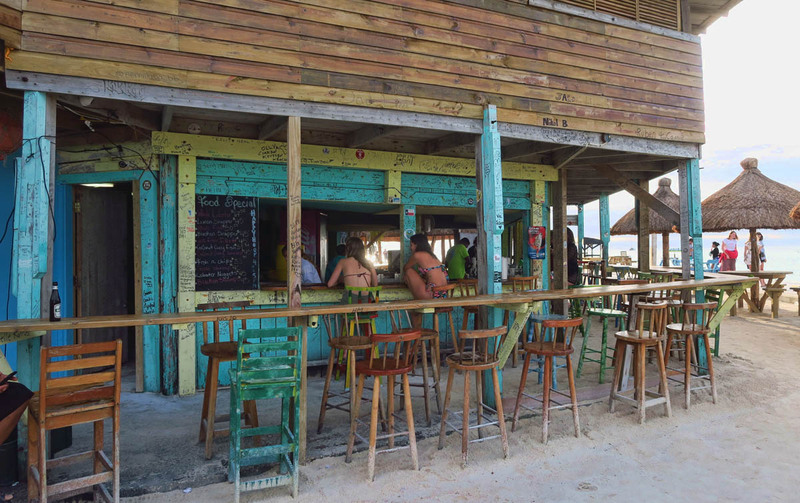 Rustic theme permeates the island, especially the bars. Rustic theme is everywhere on Caye Caulker, which is one of the reasons why I like it. 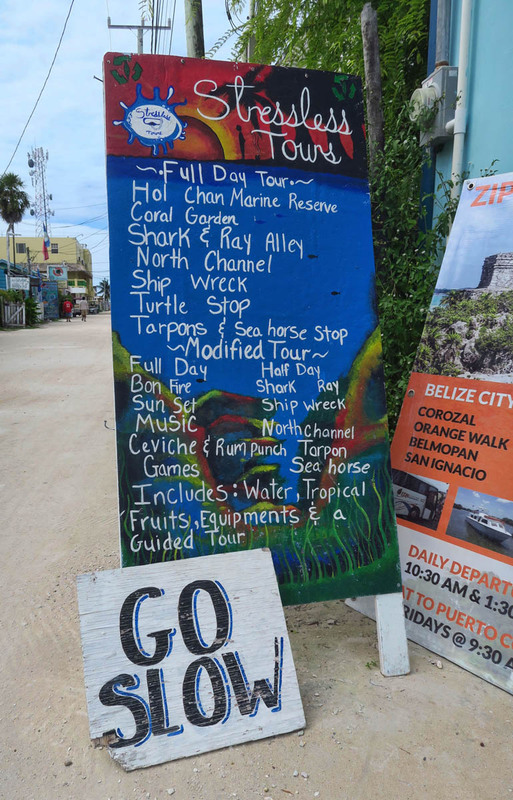 Caye Caulker is probably best known for its snorkeling tours, where boats, both motor and sail, offer day trips to Hoi Chan Nature Reserve. Unfortunately, the weather was not ideal while I was on the island. My days consisted of misty intermittent showers with gray cloud cover, or brilliant blue skies with whitecap-inducing wind. 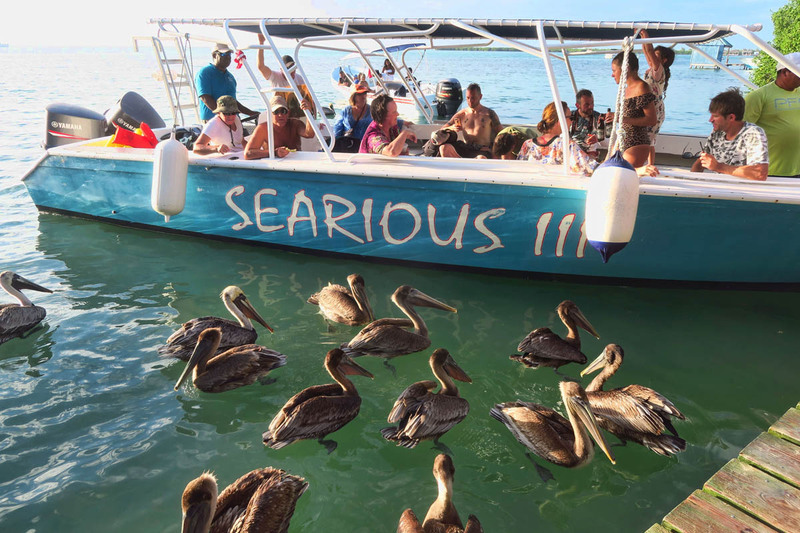 Having been to some of the best snorkeling spots on the planet, I am a bit of a “snorkeling snob.” If conditions are not ideal, I’d rather wait until they are, particularly when tours start at $70. So I watched the weather every day and waited…unfortunately, that weather window never came. 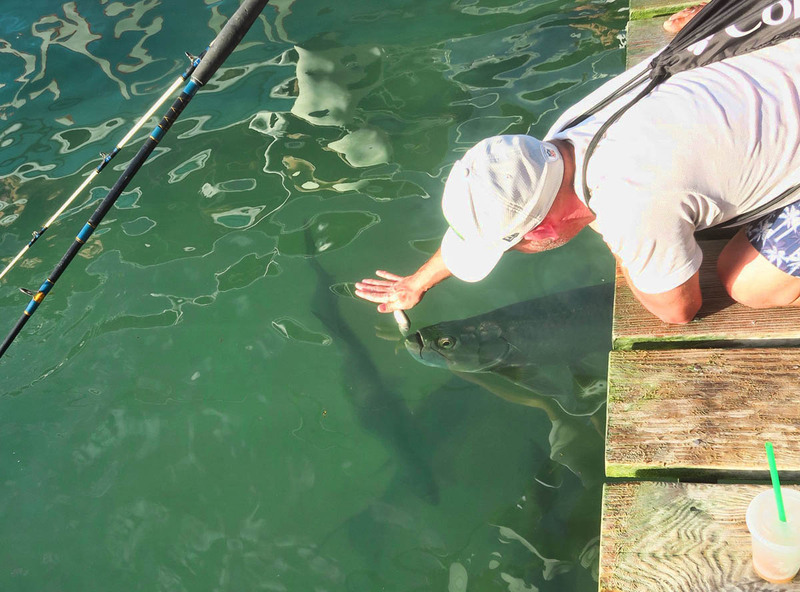 Here, small minnows are provided for tourists to dangle between their fingers to feed the giant tarpon. 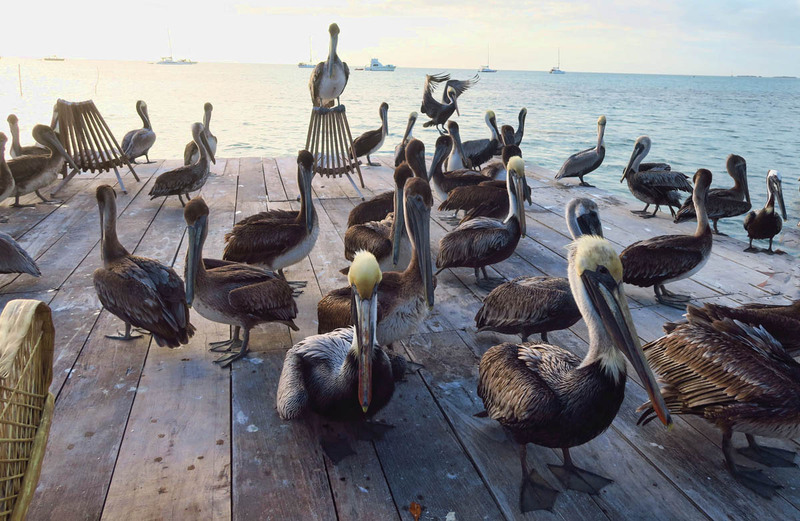 This is billed as a “pelican nursery” where they are fed each evening. 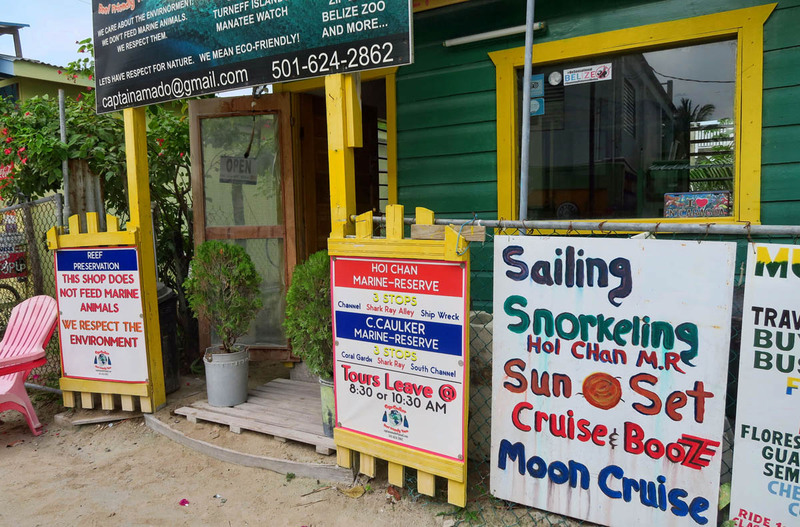 A “Seahorse Ranch.” At least I can say that none of these “feeding stations” involve captivity, nor are there fees for admission. Just something to entertain the tourists. 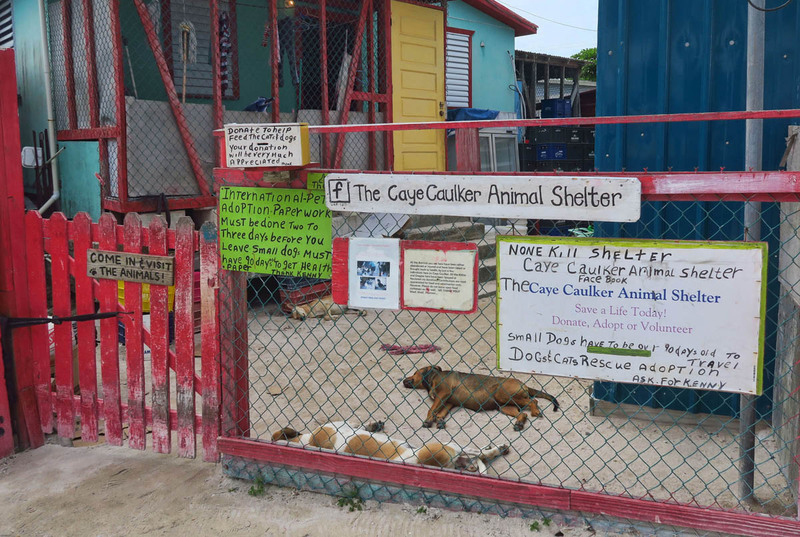 Things are pretty laid back here at the Caye Caulker Animal Shelter as well. 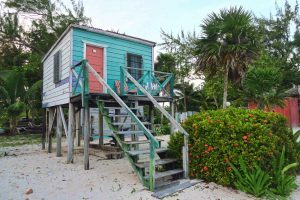 Caye Caulker is not really as much of a beach destination as one might expect, particularly for an island. 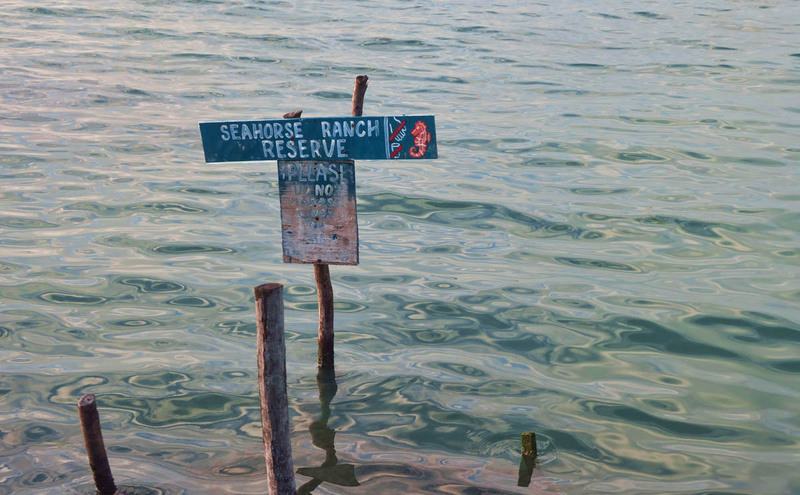 Most of the waterfront, while beautiful, is not conducive to swimming from the shore due to mangroves. 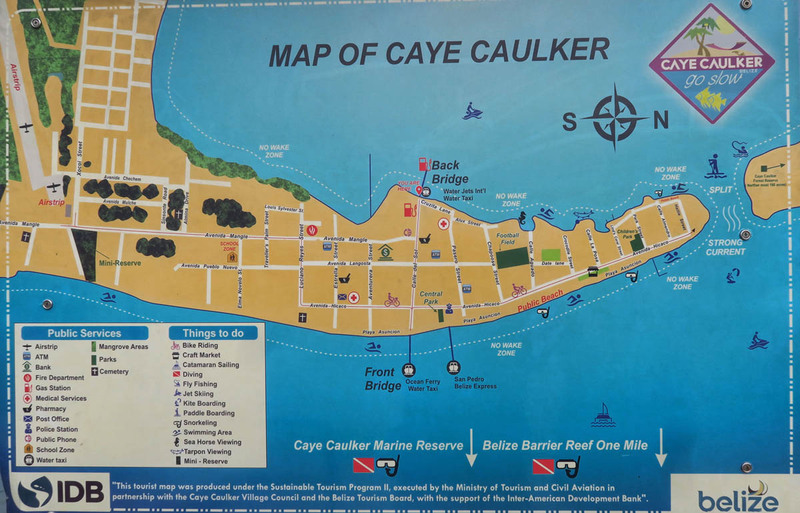 There are a couple of good places for fun in the sun, one being at “The Split.” The island of Caye Caulker was divided in half in 1961 by a cut made from Hurricane Hattie. 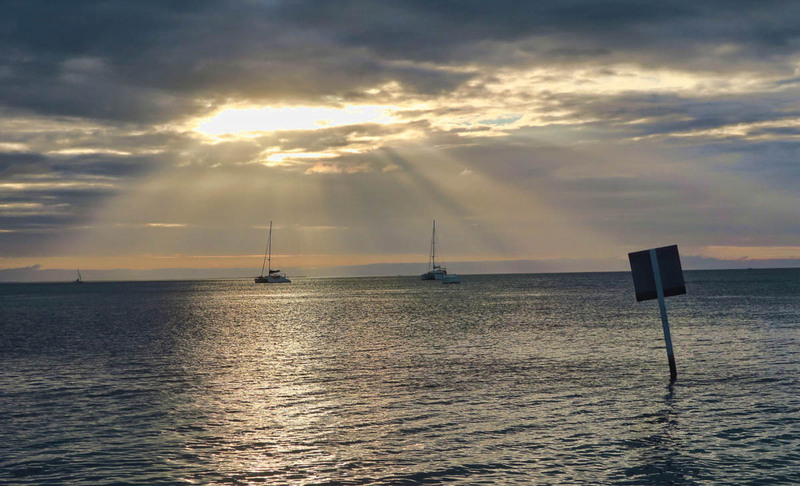 This natural wash proved to be beneficial in transiting from the east to west sides of the island, so it was dredged deeper to allow for boat traffic. 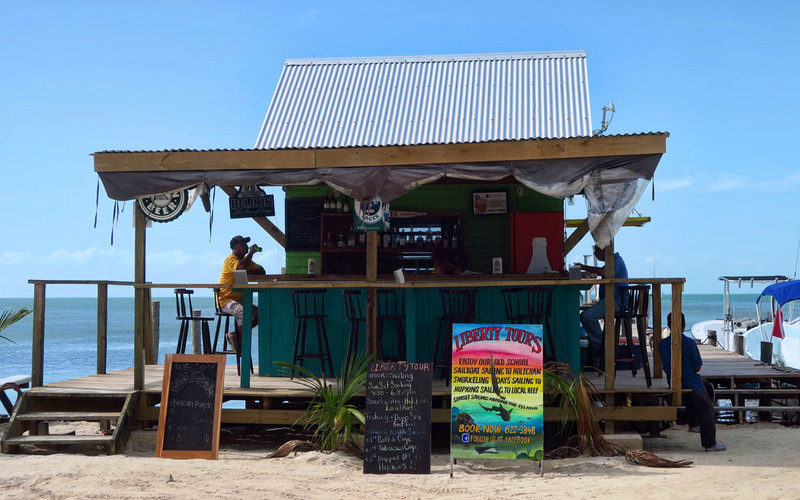 The bar at the end of the southern island, the Lazy Lizard, offers plenty of opportunity for fun in the sun, as well as a spectacular place to catch the sunset. 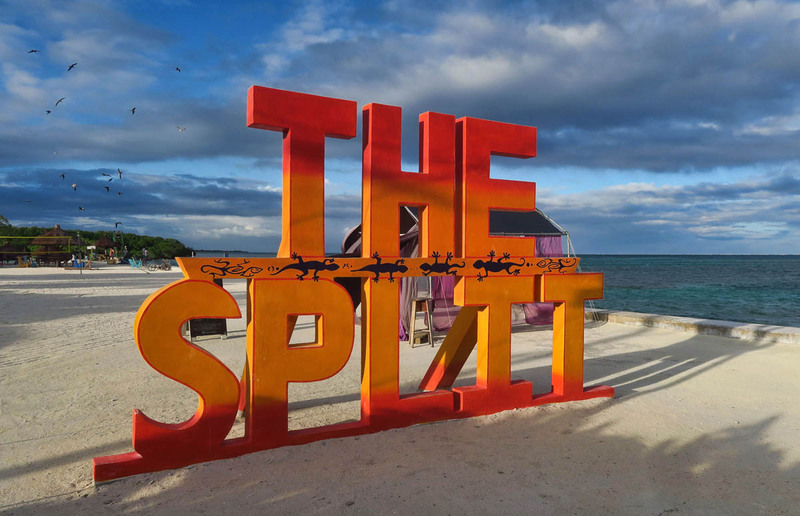 Just across the Split, the northern island is mostly mangroves, with the exception of the Koko King Beach, a beach bar and grill with hammocks, lounge chairs, and innertubes, free (as is boat transport from the south island) with the price of a bar tab. The Lazy Lizard Bar is at the South island side of The Split. Looking from the Lazy Lizard docks toward the much less inhabited north end of the island. 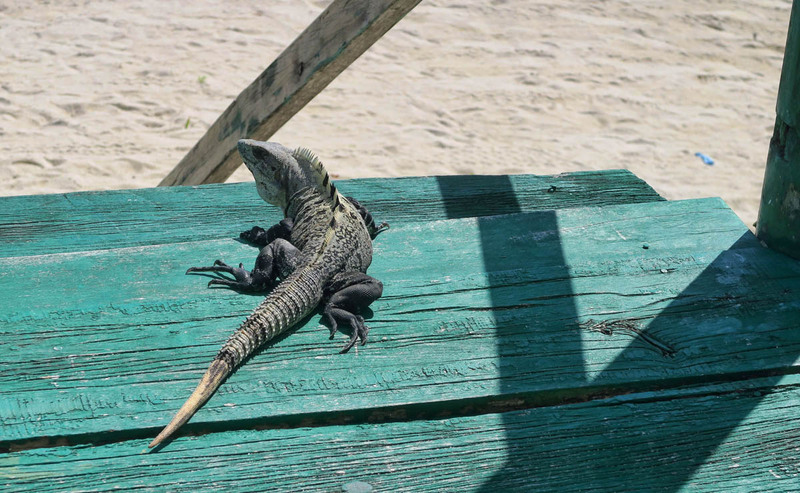 The Lazy Lizard offers the perfect spot to watch the sun set while sipping a cocktail. 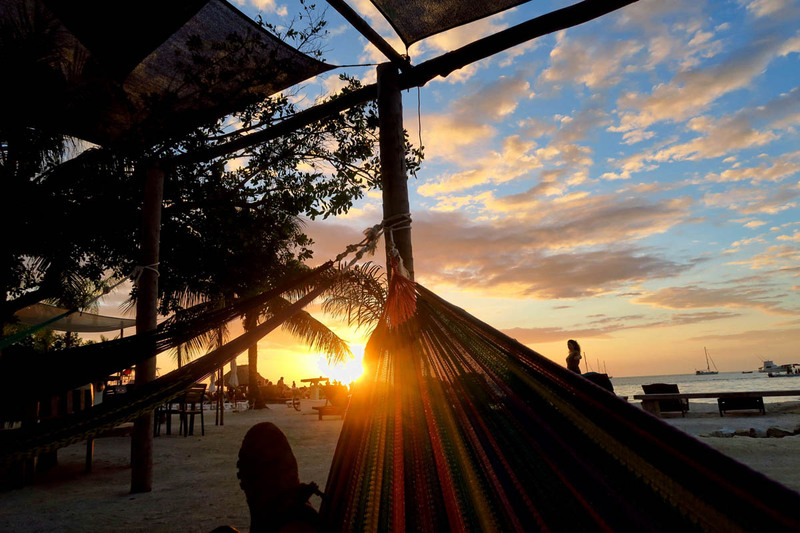 One bar on the west side even provides hammocks with sunset views. 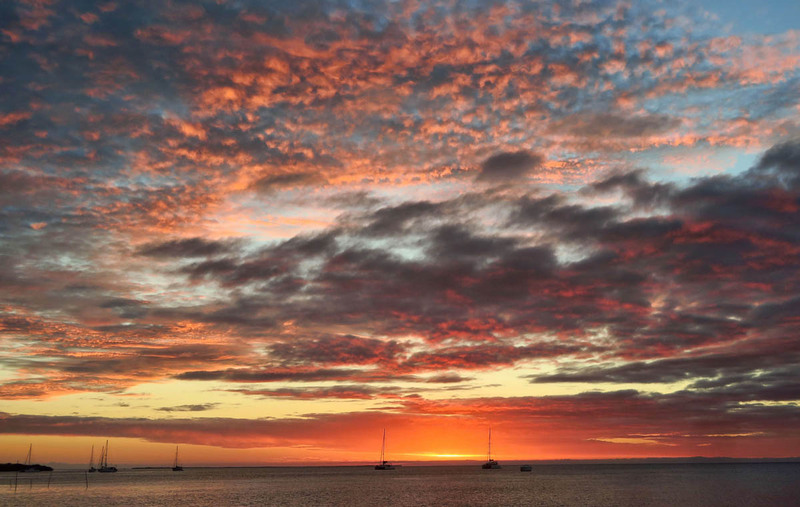 To be candid, there’s not a whole lot to do on an island that’s only five miles long. But after touring at a pretty fast pace for the past month, that’s exactly what I needed. It’s still a sleepy little island in spite of the streets being lined with open-air restaurants, bars, and dozens of tour companies. 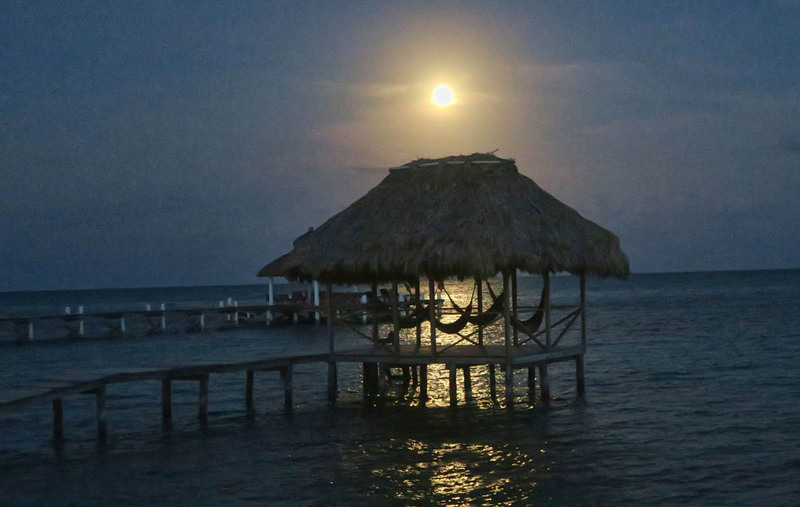 I had the good fortune to be on Caye Caulker during the lunar eclipse. 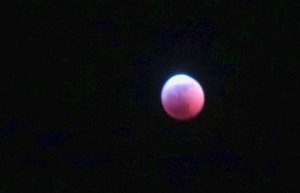 My camera doesn’t take good moon shots, so this is as good as it gets. Still a good reminder of the wonders of nature. 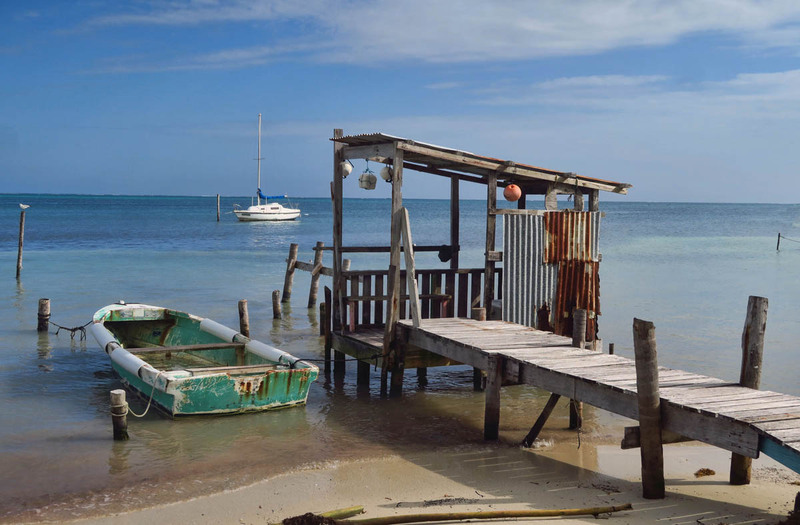 This entry was posted in Belize and tagged Caye Caulker, Chetumal, Ignacios Cabins by Suzanne. Bookmark the permalink. Brings back memories! I was there 2003 or 2004? Same impressions as your’s. 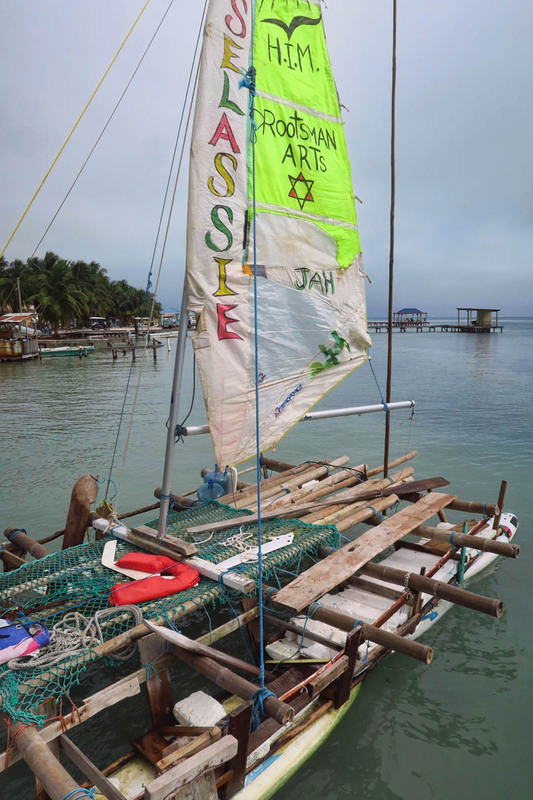 My ex and I had signed up for a Raggamuffin Tour, sailing/snorkeling/tenting 3-day trip, hitting all the off-shore islands/atolls to Placencia but they needed one more customer to make the trip 🙁 Keep thinking I’ll go back someday to do that rustic cruise if I can find five like-minded folks to make it a private party boat. What a bummer! 22 people is WAY TOO MANY! I’m surprised they didn’t have a cut-off at 14, that’s a good group. You know, when Shackleton interviewed his potential crew in England, he chose fellow shipmates based on personality first, skills second, and that’s why they all had a great time despite the hardships and deprivations. I’ve always thought I’d like to pick my own shipmates sometime on a fun exploration sailing/snorkeling/tenting expedition. Someday . . . . I’ll let you know if an opportunity arises. So glad that you persevered and kept traveling. What fun you have had, afternoon naps and all. Oops forgot to mention, you MUST do the ATM hike! It’s adventuresome, exciting, challenging and fabulous!! It’s near San Ignacio. 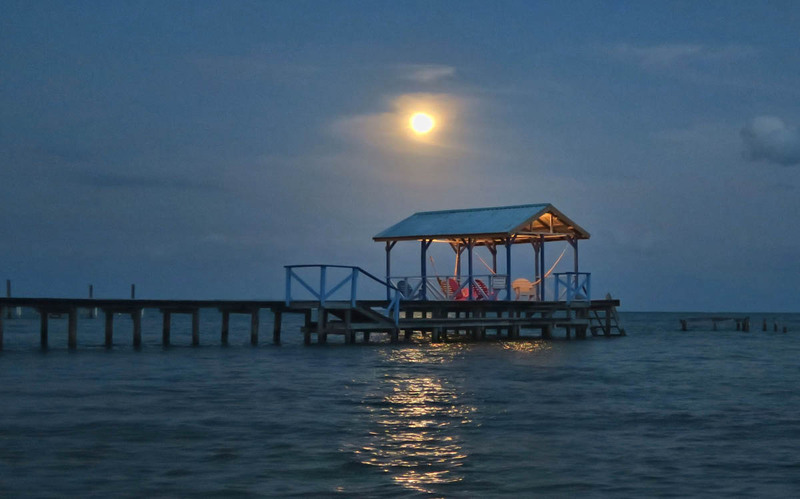 That hike was the best thing when I was there for about 10 days, plus the local bus from Placencia to San Ignacio as it’s the real deal when it comes to Belize’s culture. What an awesome place thanks for all the great pictures. What a beautiful place! So happy that you carried on with your adventure! Beautiful photos again, looks like an amazing little stretch of relaxation. So happy you’re connected again! Safe travels! I had to google this location and was delighted, even though google maps insists that I reside in Indonesia and their map data is iffy. What a fantastic location, once again thanks for expanding our knowledge of this ball upon which we live. Cannot get lobster like that in New England they insist on boiling them. can you print out the itinerary that your brother Don suggested? The sections of your route that you have written up sound great – the full plan would be helpful.